Last week, one Michigan couple lost a vital family member — and a considerable presence around the house. 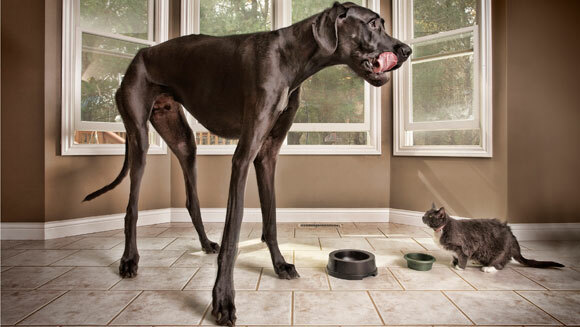 Their pet Zeus, the world's tallest dog, died on September 3 at the age of 5. Standing at 44 inches (or about three and a half feet) on all fours and 7'4" when on his hind legs, Zeus was crowned the world's tallest dog in 2012 by the Guinness Book of World Records. Despite his intimidating stature, owner Kevin Doorlag described Zeus as a "gentle giant." The Great Dane was only eight weeks old when Doorlag and his wife, Denise, took him into their home in Ostego. Something made him stand out in the litter of his siblings — perhaps it was his distinguishing size, or maybe it was his loving gaze, which would go on to define his personality. Either way, they "fell in love with him" immediately, Doorlag told ABC News. Zeus was an affectionate dog both in and out of his home. Doorlag, who is a veterinary technician, talked to ABC about Zeus' work as a certified therapy dog who'd visit schools and hospitals in the area. He'd sit on people's laps. I loved to see people's reactions when he'd sit down. He just seemed to want to make people smile and happy and … he was just a very sweet dog.